Police service animals are a valuable part of the police force in Muskogee, Oklahoma. In some senses, they are an extension of law enforcement and Oklahoma law protects them. Harming a police service animal could get you into trouble. In Oklahoma, it is unlawful to harm or interfere with a police service animal. Here are some things that you should know about the treatment of police service animals in Muskogee, Oklahoma. 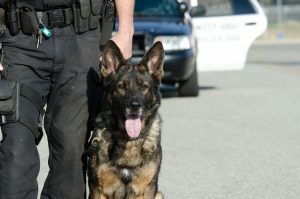 Police service animals are usually dogs and horses. Likewise, it is against the law to willfully interfere with such an animal while that animal is performing its duties. To do so is normally treated as a misdemeanor, punishable by a fine up to $500 and/or up to a year in the county jail. In addition, if convicted, a defendant must pay restitution to the agency which employed the animal. However, if the harm or interference occurred knowingly and willfully and without cause or justification during the commission of a misdemeanor or a felony, then the crime is treated as a felony, punishable by up to two years in prison and/or a fine up to $1,000, in addition to restitution. Like all crimes in Oklahoma, this crime has elements that the prosecution must prove beyond a reasonable doubt in order to obtain a conviction. If any element is left unproven, the defendant will go free. Willfully killing, beating, torturing or taking any action that could cause injury, disable or kill a police service animal is against the law in Oklahoma. Paying someone else to do so also is illegal. It is a misdemeanor to do so, and is punishable by a jail term of up to one year and/or a fine up to $1,000, in addition to restitution. However, if the injury or death occurs during the commission of a misdemeanor or felony, and is done knowingly and willfully and without lawful cause or justification, the crime becomes a felony punishable by up to five years of prison and/or a fine up to $1,000, in addition to restitution. Service animals can include animals trained for the purpose of guiding or assisting a disabled person who has a sensory, mental, or physical impairment. If you have questions or concerns for yourself or a loved one, it is important to bring these concerns to an experienced Muskogee criminal lawyer. We are here to help you. The capable, experienced Muskogee criminal defense attorneys at the Wirth Law Office will carefully explain the process and alternatives you face, and are willing and able to explore all possible defenses and fight all out for you. Get the help you need.